You are here: Home / Movie Reviews / Star Wars: The Last Jedi Movie Review!! 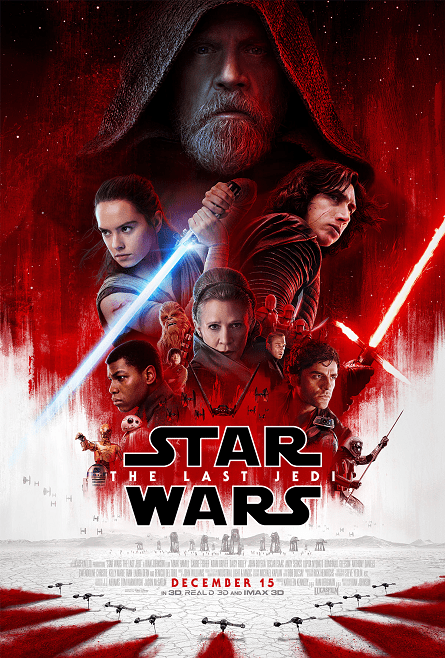 Star Wars: The Last Jedi is the biggest movie of 2017 with total worldwide sales over 1.2 billion.Â The Force Awakens had similarities to A New Hope and the Last Jedi wasn’t too far from having the same theme asÂ The Empire Strikes Back. For example, Rey going toÂ Luke on a secluded planet to train in the Force was similar with Luke’s and Yoda‘s relationship. Leia was making breakthroughs in her understanding ofÂ The ForceÂ in both movies. A battle scene surrounded in an icy environment withÂ AT-AT WalkersÂ are in both stories. Most importantly, the main premise of each film was to pull the new Force user into the fold of the dark side. Despite the similarities between the older episodes and the new, The Last Jedi turned out to be an amazing film! At the end of The Force Awakens, Luke Skywalker makes his cameo, hinting that Rey will be his next and last student. Just as the Jedi of the past, Luke lived in solitude onÂ a distant planet, fine tuning his powers in the Force. In this film, we’ve seen Luke’s growth in power since Return of the Jedi.Â Luke could manipulate the Force in such a way, he could astral project himself across the galaxy. In the battle with Kylo Ren, the audience believed Luke was actually there fighting against his former student and his forces.Â Obi Wan Kenobi was Luke’s mentor in life and death for three films. Now that Luke has become one with the Force, will he appear as a Force Spirit in the next films? Since the Empire Strikes Back, Leia was able to sense the ones she cared about through The Force. In this film, the bridge of Leia’s ship was destroyed, hurling everyone into space. Using the Force, Leia awakened from her rapidly freezing state and glided through space back to her ship’s airlock. This is a power never before seen in film. Finn has returned from his injuries he sustained from Kylo Ren and finds himself ultimately battling against his former commanding officerÂ Captain Phasma. Phasma still has the objective to end Finn’s life for betraying the Order, only to meet her seemingly demise. What is unclear in the previous film was what happened to Phasma afterÂ Han and FinnÂ used her for information? Â Anakin grew up with his droid companions R2-D2 and C3P0 during his time with The Jedi. These droid played the same role in Luke’s life when he entered into the ways of the Jedi. The bond between man and droid continues strong with BB-8 and Poe Dameron. They are not among the Jedi though, Poe just happens to be the best pilot among The Resistance. Who do you this is the best pilot among Poe, Anakin and Luke? The film was exciting and action packed for the most part. The question will always remain: Would the Star Wars franchise be any different if George Lucas stayed on board? What were your thoughts for this film? Will this be the last of the Star Wars episodes or will more movies come into creation only to bridge the episodes together like Rogue One? Check out exclusive statues for Star Wars: The Last Jedi! !